Do you have an established English Blog? Do you want to earn $50 Amazon Gift Card? Then this contest is for you. You just have to write about PrizeRebel.com on your blog. You can write about your experience, history or a review. The more in depth and detailed the better. What will I Get After I Win? 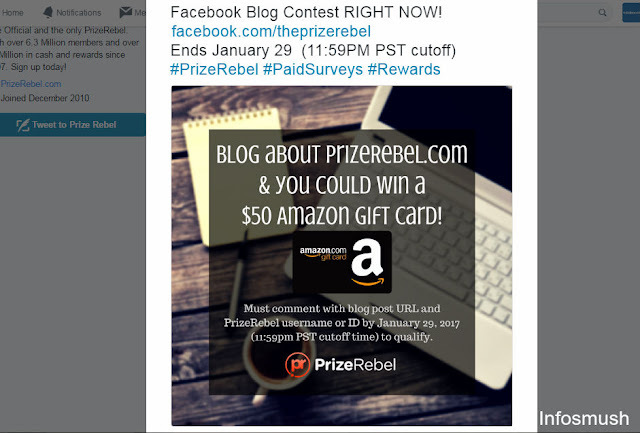 PrizeRebel is giving away $50 Amazon Gift Cards to 4 winners. In addition to this, PrizeRebel will also feature your blog on all of its social media platforms! So, by winning this contest, you’ll get a $50 Amazon Gift Card and even better; more audience for your blog. And of course, your blog's traffic will increase immensely. The blog must be in English. You Must comment on the facebook contest post at http://www.facebook.com/ThePrizeRebel. Must include the published blogpost URL, your PrizeRebel username or ID by the end of January 29, 2017 (11:59pm PST) to qualify. Good Luck for the contest.